Let little ones nap peacefully in a cozy portable crib. 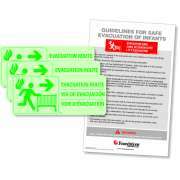 Which cribs are safe for babies? Hertz Furniture carries a range of commercial daycare cribs that give babies and toddlers a comfortable and safe place to rest. 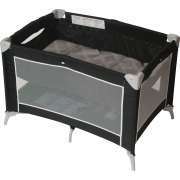 Choose from standard full-size cribs, convenient folding models and packable play yards. 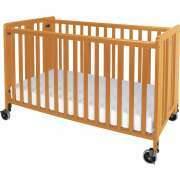 Our daycare cribs are all designed for heavy, daily use in a commercial setting. They are perfect for daycare centers, nursery schools or any early childhood setting. Whichever model you prefer, all of our cribs are priced at low institutional prices. What kind of crib should I get? Crib design is an important factor to consider before making a purchase. The classic portable crib includes bars on all four sides, so babies can see what&apos;s going on around them as they remain secure in place. Cribs with plastic teething rails protect both babies and wood. Instead of the typical bar design, some of our Foundations cribs feature clear sides which enable babies and caregivers to see each other even more clearly and encourage social interaction between little ones. Are there cribs that can adapt to children in different stages? If you are taking care of babies of different ages and stages, an adjustable-height mattress board in a portable crib can be quite useful. 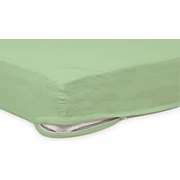 It enables you to raise or lower the height of the mattress so little babies are easier to reach and bigger toddlers cannot climb out. Keeping little babies higher up makes it easier to put them down and pick them up, so caregivers won&apos;t have to bend down and strain their backs. 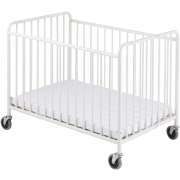 Should I get a metal crib or a wood crib? Daycare cribs come in different materials. 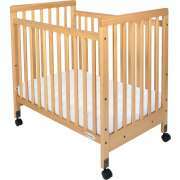 We have classic wooden cribs with both a basic and more elegant design. An alternative is the steel crib. 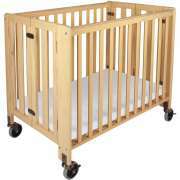 Steel cribs are highly resistant to damage and are easy to clean and disinfect. They will not dent or scratch easily. What is the easiest way to move a crib? 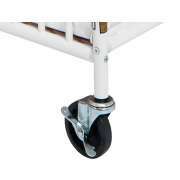 Our portable cribs stand on rolling casters so they can easily be moved from place to place. 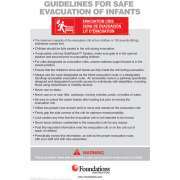 There is no need to worry about cribs getting damaged from bumping into doors or walls while in transit. 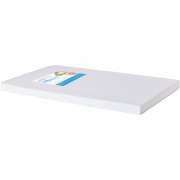 Optional crib bumpers prevent dents in wood due to accidental bumping. 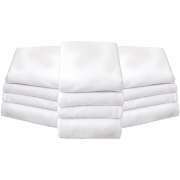 They are a great way to keep your furniture in tip top shape even with the daily rigors of a daycare center. Where can I get a compact crib that won&apos;t take up too much space? For the utmost in space-saving convenience, folding cribs are the optimal choice. You don&apos;t have to compromise on sleeping area or durability when you purchase a Foundations folding crib. They fold up compactly and open up to become sturdy, fully-functional portable cribs. Looking for a lightweight foldable option? A portable play yard can be taken virtually anywhere. Safe mesh sides provide easy viewing for caregivers and babies alike. Playards can be set up and folded down in seconds. They even come with a convenient tote bag for easy carrying. 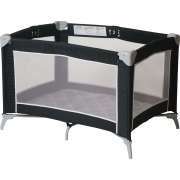 Portable cribs are available in both compact and full size. They also come with some great accessory options. 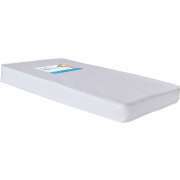 Many of our portable cribs include antimicrobial mattresses. 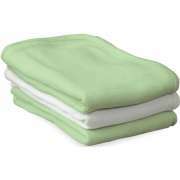 You will of course need to cover your mattresses with some soft sheets to cushion sleeping babies. Zippered crib sheets are the safe choice. They won&apos;t come off or shift around while little ones are sleeping. Purchase matching blankets for a fully-coordinated nap space. Crib drawers are the perfect place for storing extra sheets and blankets. 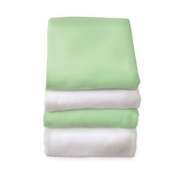 This optional accessory fits right underneath your daycare crib so extra linens are always within easy reach. You never know when you might be in need of some last-minute sheet changing, so it is helpful to stay organized and keep everything together. As a caregiver, babies are your most precious asset, so you want to make sure that they sleep comfortably in a safe portable crib. 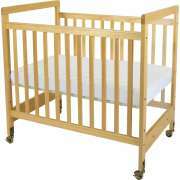 Hertz Furniture offers a great selection of daycare cribs so you can find the best choice for your little ones. Many of our models come with extended warranties, so you can enjoy many years of worry-free use. If you need help choosing the right crib for your space, contact the Hertz Design Center for free project-planning advice.